" The pacing and feelings ring true in this heartwarming depiction of someone accustomed to being the center of his universe but who responds to the impulse of hospitality and friendship." In this quiet story by Dubuc (Up the Mountain Path), the unidentified creature who appears in front of squirrel Otto's tree trunk dwelling isn't just uninvited, he's inconvenient... Slowly, Otto realizes that Pio is generous and helpful. And when Pio rescues him from a frightening predator, he decides that it might be worth making room to accommodate his new friend. Dubuc doesn't insist that readers warm right up to new or strange situations. It takes a long time, sometimes, for creatures to learn to love each other. 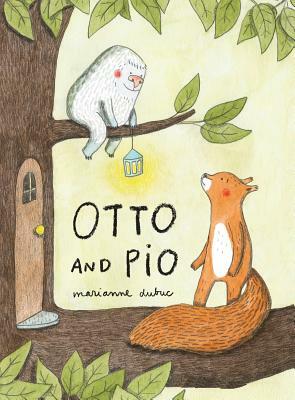 "Marianne Dubuc's delightful tale of oddball friendship and unexpected domesticity." "Dubuc's soft watercolor-and-pencil illustrations unfold as individual scenes-often two per page-that trace Otto's fruitless search and Pio's astonishing growth, which poses a whole new set of problems. Pio steadily turns Otto's house into a home by cleaning, decorating, and making soup while Otto is away. These small acts are heartwarming for readers and Otto alike, effectively demonstrating how love and family can come in all shapes and sizes." "A family tale that teaches children how love makes a home. Dubuc has created a simple and beautiful story that is perfectly matched with her intricate illustrations. The colors are soft and bright, giving readers a warm fuzzy feel­ing as they travel through the story. The entire book is clean and simple, not too difficult to follow, and explains an often-complex rela­tionship in the best way possible. This engag­ing read-aloud will warm children's hearts. It has a terrific message about the importance of family and how to care for those you love. An excellent and timeless selec­tion for all picture book shelves."